Since it’s Thanksgiving weekend here in Canada I figured it would be fun to incorporate a holiday ingredient such as cranberries into a cocktail. 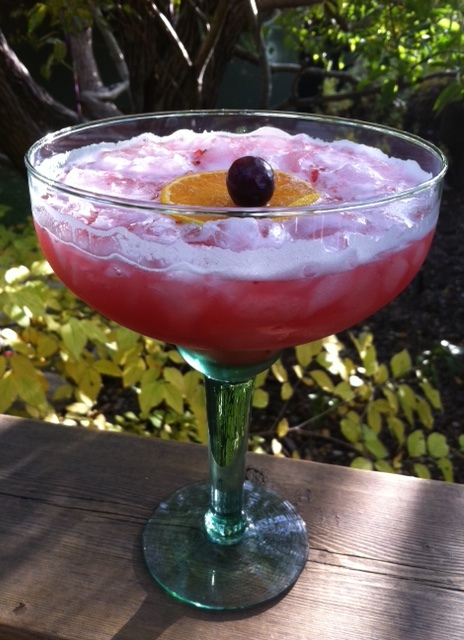 I googled “cranberry sauce in cocktails” and stumbled upon this gem from Mint/820, a bar in cocktail-crazed Portland, Ore.: the Cranberry Jalapeño Margarita. It promised to be a tarter, prettier, more festive version of one of my favourite cocktails. Since I didn’t have a fresh jalapeño on hand I improvised with some jalapeño pepper jelly. And without lemons — like the recipe called for — I used fresh mandarin orange juice, as I thought it would pair nicely with the cranberry sauce. The ratios were also a bit wonky, calling for 2-1/2 oz of tequila but only 1/4 oz of Cointreau, for example, so I adjusted them according to my palate. I also added an egg white as I am currently loving how they smooth out and bind sour cocktails. The result is a delicious twist on a margarita that’s tart, just spicy enough, and sweet from orange juice and cranberry sauce rather than simple syrup (true, there’s a touch of agave syrup as well). I also love the colour — it’s perfect for a fall day, turkey or no. 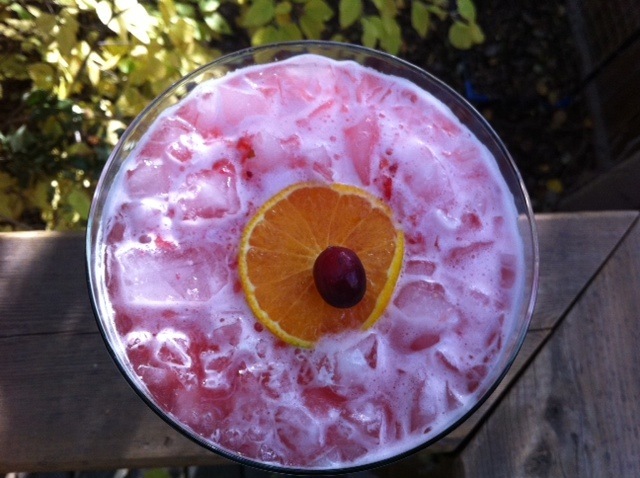 That’s a fresh-cranberry-atop-an-orange-slice garnish. Very festive! Method: Combine ingredients in a cocktail shaker with ice. Shake vigorously to dissolve the cranberry sauce and jelly, then strain into a margarita glass filled with crushed ice (there will be bits of cranberry and pepper seeds from the jelly that get through, but it adds a nice texture). Garnish with a single cranberry atop an orange slice. This entry was posted in Cocktails and tagged cranberry margarita, Patron tequila, tequila cocktail recipes, Thanksgiving cocktails, twists on a margarita. Bookmark the permalink.